‘Two hungry cats join forces to gobble down a festive feast’. 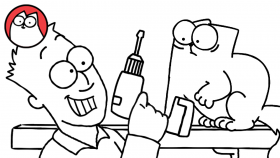 Watch our latest Simon’s Cat film. A Thanksgiving special dedicated to all the cat owners. A curious cat helps his owner with DIY home improvements. It’s National Sandwich Day! Simon’s Cat sneakily ham-pers Simon’s attempts to make a ham sandwich. 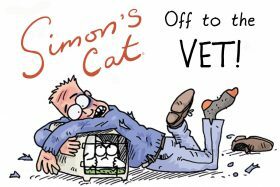 After an unfortunate encounter, Simon’s Cat goes to great lengths to avoid a visit to the vet. Will his long-suffering owner step up to the challenge? 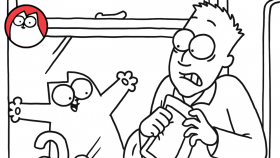 Simon’s Cat FINALLY gets into the attic and gives Simon a spooky surprise! . 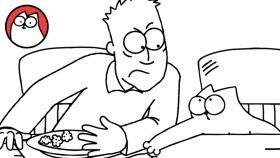 The mischievous kitten interrupts Simon’s Cat during his ‘me time’ manicure proving that little brothers really can be annoying. Does the kitten remind you of anyone? Do your cats have younger siblings? Do you have an annoying younger brother? 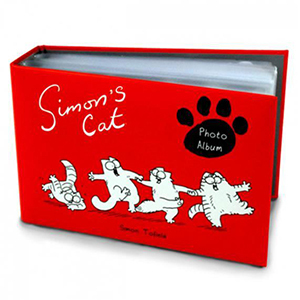 Poor Simon is under the weather will a visit from the cat help him bounce back? Featuring Simon, the cat and a serious case of the sniffles. Easter egg season is here and we have hidden some sneaky eggs in one of our classic films! How many do you see?